To backtrack means that you have to go back though an area that you've already been though, like if you have to return to an area after you've gotten an item that lets you explore more of that area. If i made a GFX pack fully created with actual graphics from PC Engine/TurboGrafx-16 games, would it be allowed? Topic: Characters you would like to see by the time SMBX 2.0 is out of beta? Re: Characters you would like to see by the time SMBX 2.0 is out of beta? That's not really major enough to warrant a new character though. Ahh... good ol' Super Mario Flash. 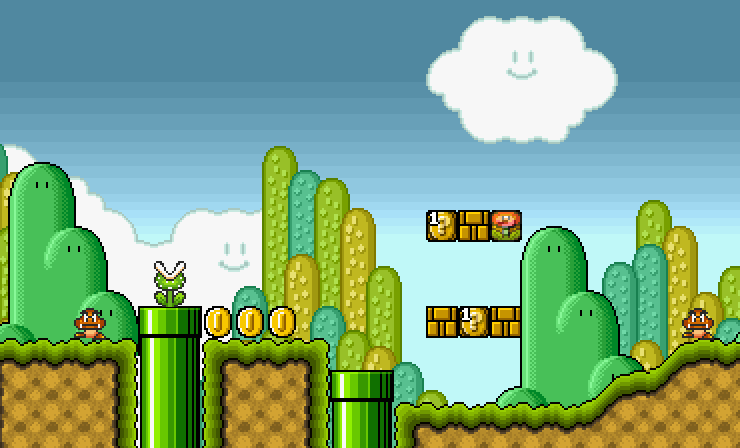 I remember playing it a long time ago and enjoying the level editor quite a bit, although it definetly hasn't aged too well compared to games like SMBX. I should really try it again sometime. Topic: Dersen's Kingdom (New: 1-5: Koopa's Castle). Re: Dersen's Kingdom (New: 1-5: Koopa's Castle). I do not do 2.0 because it's too weak for me, PGE is too difficult for me. What do you mean with "too weak"? Friendly reminder: no Virtual Console =/= no support for classic games. They've probably got something else planned. This project looks great so far! I'm also creating a project based off of Super Mario 63 too! It's titled "Mario and the Missing Shine Sprites". Hope you'll come back to finish the project soon! Yes. SMBX is better than MM.